MasterBox have staged a mock battle in this set – their latest set depicts a bunch of paratroopers – “Red Devils” of the English Parra corps and the US Airborne compatriots – hosting a friendly boxing match – the set is pretty neatly divided amongst both English and American figures. The excellent box art conveys the dramatic scene – set amongst a backdrop of DC-3 glider tugs the two sides – US and England – are putting their best fighter forward to make a boxing contest – presumably with the winners getting bragging rights – this is a great idea seeing one day we will see a Horsa Glider from MasterBox in 35th – what a great backdrop that would make? Roll on more Paratrooper figures I say! 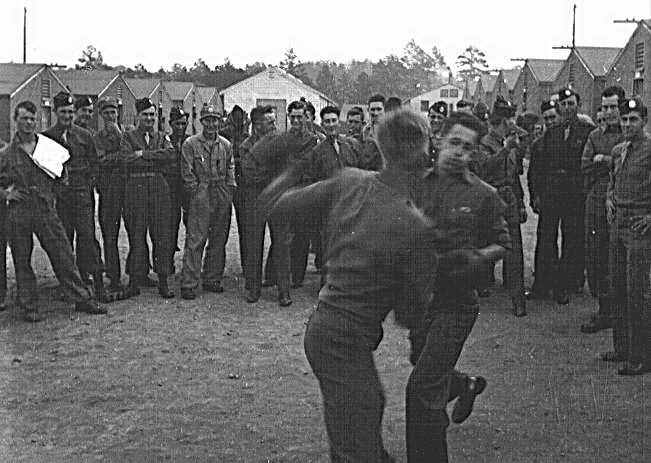 Boxing matches were a common sight in training and keeping up the morale of combat soldiers – often bored behind the front lines or in training – here in this picture we have the real thing – although a bit changed from this set - Easy Company of the 506th PIR US Airborne watches a boxing match at Toccoa in the US at their original training camp. Let’s look more closely at this kit. The rear of the box serves a few purposes – a colour guide is given in Lifecolor and Vallejo acrylics colour numbers – two of the more popular paints on the market. Each soldier is shown painted up here. These painting diagrams also act as a construction guide – showing you where to put the parts on each of the nine (yes nine!) figures supplied in the box. As MasterBox’s figures are a pretty basic construction – the parts being laid out very logically in their own section on each sprue – I made these nine figures with just a cursory glance at the stance of each figure only. Such a simple layout on the sprue is to be commended. Although there aren’t any numbers on the sprues there are some for the modelling challenged on the rear of the box. A word or two about the plastic before we look at each of the figures. 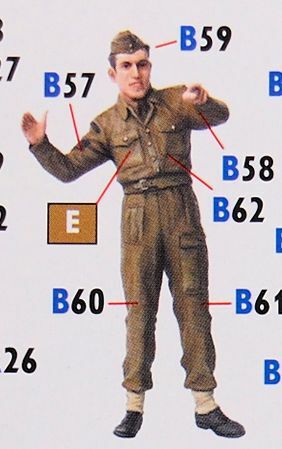 There are two sprues in the regulation tan colour in the box – neatly divided as I was saying into a section (usually a quarter each) for each figure. The plastic has no distortion and is really good in the area of no flash and very little in the way of seam lines – these are a bug-bear of the injection moulding process – just the lightest of scrapes is needed here to remove any seams. I think MasterBox has improved their quality in this area and I would congratulate them for this. There is some nice detail in the injection parts – with the faces all looking different and conveying expression. Little details like the folds on the various different clothing (everyone seems to have a slightly different outfit on here) are well sculpted. 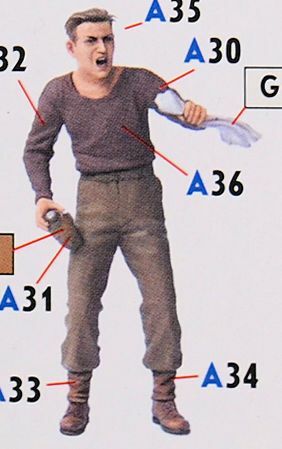 There are the usual small gaps in some of the arm joints of these kits – I have shown them Au natural so you know what you are getting – they are however an easy fix with just a little sanding and light filler in some places – more care in construction I might add could solve all of your problems. This snap happy reporter from the US is wearing standard non-combatant’s fatigues and a cap style hat – slightly pushed up to squeeze his camera under. You can angle his hands to be either looking over the camera or through the lens – I am not sure if this is a design feature but let’s say it is. He is leaning slightly forward whilst framing his subjects; he stands up quite easily by himself which is a good judgement of proper body language balance. Is seen here in British serviceman’s fatigues – he wears a flat forage cap and leggings over his pants and black boots. He is directing the reporter photographer’s attention towards the action – thanks mate! This US Airborne soldier is my favourite. He has real emotion in his face while cheering his man on with a clenched fist. He is dressed in US airborne fatigues – complete with flat side cap and jump boots with his pants tucked into them. Creating some interest as well is the little puppy he is holding, cradled in his left arm the puppy just slotted into the neat hole made – I do have to say well done to MasterBox as well in their engineering of the sockets and joints on this whole kit. …Is seen again cheering for the honour of the Red Devils - he has a beret on here – I would make mine in the scarlet of the Parras – as the beret here has a round emblem on it that isn’t a paratrooper – just to make him fit in a little better. I made sure I did a very slight adjustment of drilling hollow this soldier’s mug – it was moulded solid – just to give some detail – it only took a minute. 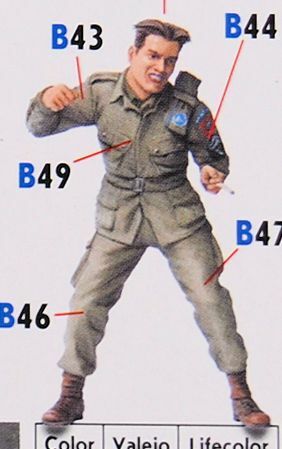 I like the emotion in this solder’s stance. This soldier is obviously the trainer of the English fighter – why? Well he has a towel! I won’t do any “throwing it in” jokes as these guys were rock hard in real life. Wearing a beret with a diamond badge on it and carrying a towel around his neck this soldier is seen clenching his right fist – almost in the fight himself! 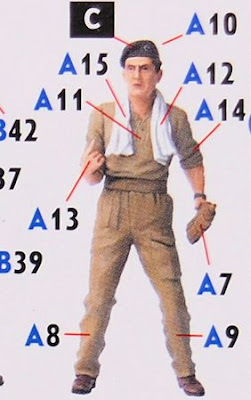 An interesting assembly point of this soldier was adding the ends of the towel after he is built – this way you can make more depth between the towel ends and the soldier’s body. It also allows the towel to cover any neck joint and to sit in there very snugly. Seen are the fighter’s long lean muscles which were a bit exaggerated at the arm joints – a slight bit of putty or sculpting will fix that. It’s very hard to model the naked body in injection moulding! 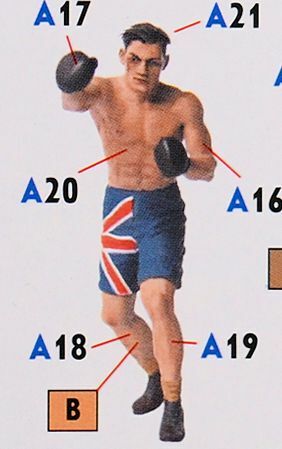 This soldier from the British corner is seen striking out at his opponent and in the instructions he has a Union Jack of the British flag on his shorts – I am not sure if that would have been the case – but it looks great here. Striking out with muscles flexing he is a great sculpt and I am sure you could portray him or his friendly combatant missing or landing a blow for his team. 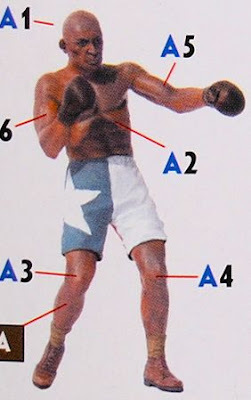 Like his opponent this is a nicely conceived and sculpted figure. He sure is yelling! 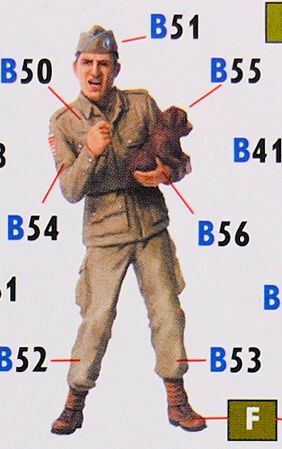 You get the real emotion in this figure as he goads on his man – noted are his larger US style canteen water bottle opposed to the English trainer’s smaller bottle – little details like this and all of the varied clothing on show here – really help this scene look more realistic. This fella looks like he is in the fight himself! I am sure if you wanted to you could depict most of these soldiers in a bar-room fight! They are all so into the action from the body language and the expressions on their faces. Wearing his flat cap folded in his side boards as many soldiers did – this is added after construction to add depth to the figure and again a point of difference from his colleagues. His hair and fine work on the pockets of his battledress are of special note. It’s a win to both sides! Well that is it – what more can I say except well done MasterBox! 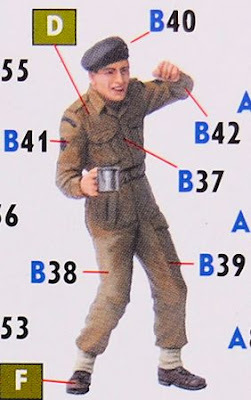 They are making ever more dramatic – though some would say less useful on every diorama – theirs tuff I am seeing on many modelling tables now – often complimenting or stealing the scene from more well-known resin figures. 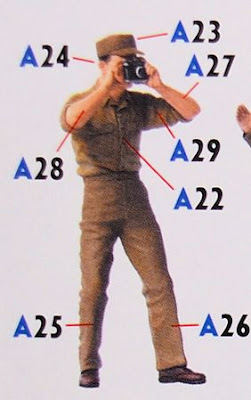 The dramatic poses – the detail and the lack of any (major) seams make this an easy to make set that will make a great diorama. Now if only we had a 1/35th Horsa glider to display them in front of….